The Alhambra (Arabic: الحمراء—Al-Ħamrā'; literally "the red") is a palace and fortress complex of the Moorish monarchs of Granada in southern Spain, occupying a hilly terrace on the southeastern border of the city of Granada. Mohammed I, the first king of the Nasriden—a Moorish dynasty in Granada—converted a ninth-century castle into his private royal residence, and it is this which we now know as the Alhambra. 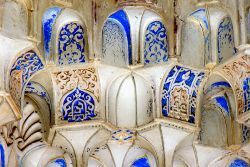 The structure, currently a huge museum exhibiting exquisite Islamic architecture, is renowned for its stunning frescoes and interior detail. A Renaissance palace was also inserted by Charles V, Holy Roman Emperor. The buildings are some of the finest examples of Moorish architecture in the world and the site is among Europe’s most-visited tourist attractions. 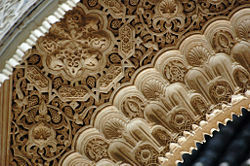 Over the years, the Alhambra has had widespread influence on art, music, and architecture. The Alhambra was listed as World Heritage Sites by UNESCO in 1984. The selection was based on the following criteria: That it represents a masterpiece of human creative genius; it exhibits an important interchange of human values; and it is an outstanding example an architectural ensemble which illustrates a significant stage in human history. View of the Alhambra from the "Mirador de San Nicolás" in the Albaycin of Granada. The terrace or plateau where the Alhambra settles, measures about 2,430 feet in length by 674 feet at its greatest width, extends from W.N.W. to E.S.E., and covers an area of about 169,831 square yards. It is enclosed by a strongly fortified wall, which is flanked by 13 towers. The river Darro, which flows through a deep ravine on the north, divides the plateau from the Albaicín district of Granada; the Assabica valley, containing the Alhambra Park, on the west and south, and beyond this valley the almost parallel ridge of Monte Mauror, separate it from the Antequeruela district. Moorish poets described it as "a pearl set in emeralds," in allusion to the brilliant color of its buildings, and the luxuriant woods around them. The park (Alameda dé la Alhambra), in spring overgrown with wild-flowers and grass, was planted by the Moors with roses, oranges and myrtles. The park's most characteristic feature, however, is the dense wood of English elms brought there in 1812 by the Duke of Wellington. It is celebrated for the multitude of its nightingales, and is usually filled with the sound of running water from several fountains and cascades. These are supplied through a conduit five miles long, which is connected with the Darro at the monastery of Jesus del Valle, above Granada. 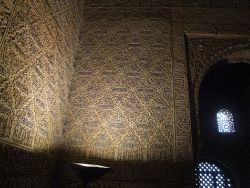 In spite of the long neglect, vandalism, and sometimes ill-judged restoration which the Alhambra has endured, it still remains the most perfect example of Moorish art in its final European development, freed from the direct Byzantine influences which can be traced in the Mezquita cathedral of Córdoba, more elaborate and fantastic than the Giralda at Seville. The majority of the palace buildings are, in ground-plan, quadrangular, with all the rooms opening on to a central court; and the whole reached its present size simply by the gradual addition of new quadrangles, designed on the same principle, though varying in dimensions, and connected with each other by smaller rooms and passages. While fountains and flowing water are a common feature around the Alhambra, they are particularly prevalent in the Palacio de Generalife. In every case the exterior is left plain and austere, as if the architect intended thus to heighten by contrast the splendor of the interior. Within, the palace is unsurpassed for the exquisite detail of its marble pillars and arches, its fretted ceilings and the veil-like transparency of its filigree work in stucco. Sun and wind are freely admitted, and the whole effect is one of the most airy lightness and grace. Blue, red, and a golden yellow, all somewhat faded through the lapse of time and exposure, are the colors chiefly employed. The decoration consists, as a rule, of stiff, conventional foliage, Arabic inscriptions, and geometrical patterns wrought into arabesques of almost incredible intricacy and ingenuity. Painted tiles are largely used as paneling for the walls. Along with the Alhambra, two associated sites in Granada—the Albaycin and the Generalife—were also selected in 1984 for World Heritage status. According to UNESCO, " Rising above the modern lower town, the Alhambra and the Albaycín, situated on two adjacent hills, form the medieval part of Granada. To the east of the Alhambra fortress and residence are the magnificent gardens of the Generalife, the former rural residence of the emirs who ruled this part of Spain in the thirteenth and fourteenth centuries. The residential district of the Albaycín is a rich repository of Moorish vernacular architecture, into which the traditional Andalusian architecture blends harmoniously." The Tower of Justice (Torre de la Justicia) is the original entrance gate to the Alhambra, built by Yusuf I in 1348. 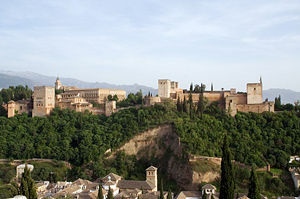 The Alhambra resembles many medieval Christian strongholds in its threefold arrangement as a castle, a palace, and a residential annex for subordinates. The Alcazaba or citadel, its oldest part, is built on the isolated and precipitous foreland which terminates the plateau on the northwest. These are the sole remaining massive outer walls, towers, and ramparts. A turret containing a huge bell was added in the eighteenth century, and restored after being damaged by lightning in 1881. Beyond the Alcazaba is the palace of the Moorish kings; and beyond this, again, is the Alhambra Alta (Upper Alhambra), originally occupied by officials and courtiers. 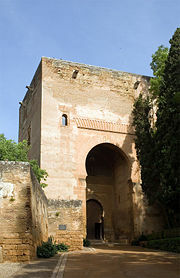 Access from the city to the Alhambra Park is afforded by the Puerta de las Granadas (Gate of Pomegranates), a massive triumphal arch dating from the fifteenth century. A steep ascent leads past the Pillar of Charles V, a fountain erected in 1554, to the main entrance of the Alhambra. This is the Puerta Judiciaria (Gate of Judgment), a massive horseshoe archway, surmounted by a square tower, and used by the Moors as an informal court of justice. A narrow passage leads inward to the Plaza de los Aljibes (Place of the Cisterns), a broad open space that divides the Alcazaba from the Moorish palace. To the left of the passage rises the Torre del Vino (Wine Tower), built in 1345, and used in the sixteenth century as a cellar. On the right is the palace of Charles V, a cold-looking but majestic Renaissance building, out of harmony with its surroundings, which it tends somewhat to dwarf by its superior size. The Court of the Lions features a unique example of Islamic animal statues. The present entrance to the Palacio Árabe (Moorish palace), is by a small door from which a corridor conducts to the Patio de los Arrayanes (Court of the Myrtles). This court is 140 feet long by 74 feet wide; and in the center there is a large pond set in the marble pavement, full of goldfish, and with myrtles growing along its sides. There are galleries on the north and south sides; that on the south is 27 feet high, and supported by a marble colonnade. The Salón de los Embajadores (Hall of the Ambassadors) is the largest in the Alhambra, and occupies all the Torre de Comares. It is a 37-foot-square room, while the center of the dome is 75 feet high. This was the grand reception room, and the throne of the sultan was placed opposite the entrance. It was in this setting that the Edict of Expulsion was signed and Christopher Columbus received Isabel and Ferdinand's support to sail to the New World. The celebrated Patio de los Leones (Court of the Lions) is an oblong court, 116 feet by 66 feet, surrounded by a low gallery supported on 124 white marble columns. A pavilion projects into the court at each extremity, with filigree walls and a light domed roof, elaborately ornamented. In the center of the court is the celebrated Fountain of Lions, a magnificent alabaster basin supported by the figures of 12 lions in white marble. It has been said that the lions were most likely sculpted by members of the Jewish community who had inhabited Spain prior to their extradition along with the Muslims. "Honeycomb," "stalactite," or "mocárabe" vaulting in the "Hall of the Abencerrajes"
The Sala de los Abencerrajes is a perfect square, with a lofty dome and trellised windows at its base. The roof is exquisitely decorated in blue, brown, red, and gold, and the columns supporting it spring out into the arch form in a remarkably beautiful manner. Opposite to this hall is the Sala de las dos Hermanas (Hall of the two Sisters), so-called from two very beautiful white marble slabs laid as part of the pavement. These slabs measure 15 by 7.5 inches, and are without flaw or stain. There is a fountain in the middle of this hall, and the roof —a dome honeycombed with tiny cells, all different, and said to number 5000— is a magnificent example of the so-called "stalactite vaulting" of the Moors. Among the other wonders of the Alhambra are the Sala de la Justicia (Hall of Justice), the Patio del Mexuar (Court of the Council Chamber), the Patio de Daraxa (Court of the Vestibule), and the Peinador de la Reina (Queen's Robing Room), in which are to be seen the same delicate and beautiful architecture and the same costly and elegant decorations. The palace and the Upper Alhambra also contain baths, ranges of bedrooms and summer-rooms, a whispering gallery and labyrinth, and vaulted sepulchers. The original furniture of the palace is represented by the celebrated vase of the Alhambra, a splendid specimen of Moorish ceramic art, dating from 1320, and belonging to the first period of Moorish porcelain. 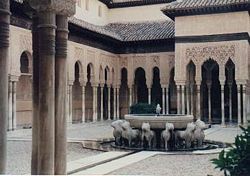 Of the outlying buildings in connection with the Alhambra, the foremost in interest is the Palacio de Generalife or Gineralife (the Muslim Jennat al Arif, "Garden of Arif," or "Garden of the Architect"). This villa probably dates from the end of the thirteenth century, but has been several times restored. Its gardens, however, with their clipped hedges, grottoes, fountains, and cypress avenues, are said to retain their original Moorish character. The Villa de los Martires (Martyrs' Villa), on the summit of Monte Mauror, commemorates the Christian slaves who were forced to build the Alhambra, and confined here in subterranean cells. The Torres Bermejas (Vermilion Towers), also on Monte Mauror, are a well-preserved Moorish fortification, with underground cisterns, stables, and accommodation for a garrison of 200 men. Several Roman tombs were discovered in 1829 and 1857 at the base of Monte Mauror. The name Alhambra derives from the color of the red clay from which the fort is made. The buildings of the Alhambra were originally whitewashed; however, seen today they are reddish. The first reference to the Qal’at al Hamra was during the battles between the Arabs and the Muladies (a mixed-ancestry group that lived in the Iberian Peninsula in the Middle Ages) during the rule of the Abdallah (reigned 888-912). In one particularly fierce skirmish, the Muladies soundly defeated the Arabs, who were then forced to take shelter in a primitive red castle located in the province of Elvira, located in today's Granada. According to surviving documents from the era, the red castle was quite small and its walls were not capable of deterring an army intent on conquering it. The castle was then largely ignored until the eleventh century when its ruins were renovated and rebuilt by Samuel ibn Naghralla, vizier to King Bādīs of the Zirid Dynasty, in an attempt to preserve the small Jewish settlement located on the Sabikah hill. However, evidence from Arab texts indicates that the fortress was easily penetrated and that the actual Alhambra that survives today was built later, during the Nasrid Dynasty. The design included plans for six palaces, five of which were grouped in the northeast quadrant forming a royal quarter, two circuit towers, and numerous bathhouses. Over the reign of Nasrid Dynasty, the Alhambra was transformed into a palatine city complete with an irrigation system for the lush and beautiful gardens located outside the fortress. 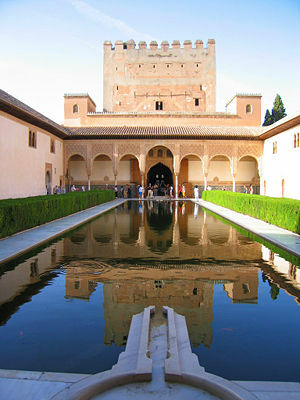 The creation of the “Sultan’s Canal” solidified the identity of the Alhambra as a sumptuous palace-city rather than a defensive and ascetic structure. 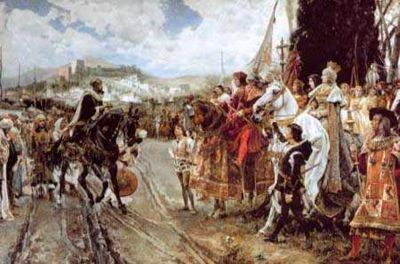 The Capitulation of Granada by F. Padilla: The Muslim King Boabdil surrenders to Ferdinand and Isabella. The Alhambra is visible in the background. The reconquest of Granada, the last bastion of Muslim Spain, was accomplished by Christian forces and was completed at the Battle of Covadonga in 1492. Despite its previous status as a haven for Jews and a glorious emblem of Arabic architecture, the Alhambra would soon be known to history as the place where peaceful coexistence among Christians, Muslims, and Jews in Spain came to its final end. In the Alhambra's Sala de Embajadores (Hall of the Ambassadors), the magnificent tower overlooking the city with the galaxy of stars embedded in its arched ceiling, the Catholic monarchs Isabel of Castile and Ferdinand II of Aragon signed a decree ordering the expulsion of Jews from Spain, on March 31, 1492. The Alhambra Decree, also known as the "Edict of Expulsion," demanded that all Jews leave the Kingdom of Spain and its territories and possessions. In the decree, proclaimed less than three months after the surrender of Granada, the monarchs accused the Jews of trying "to subvert our holy Catholic faith and trying to draw faithful Christians away from their beliefs." All Jews were ordered to leave the kingdom by "the end of July of this year." They were permitted to take their belongings with them—except "gold or silver or minted money." Punishment for a Jew who did not leave was death. Punishment for non-Jews who sheltered or hid Jews was the confiscation of all belongings and hereditary privileges. The Alhambra Decree stood in stark contrast to the policy of La Convivencia ("Coexistence"), describing the situation in Spanish history from about 711 to 1492, when Jews, Muslims, and Catholics in Spain lived in relative peace together within the different kingdoms. The phase often refers to the interplay of cultural ideas between the three groups, and ideas of religious tolerance. After the reconquest, much of the interior of the Alhambra was damaged and furniture was ruined or taken. Sections of the complex were either rebuilt in the Renaissance style or leveled so that Charles I of Spain (who was also Charles V of the Holy Roman Empire) might build an Italianate palace. Charles built the grand circular Christian palace known as the Palacio de Carlos Quinto, which stands today in the midst of the Alhambra, for the simple reason that he thought the Alhambra was a fine place to live, but wanted a building commensurate with his importance. In spite of its artistic clash with the delicate Moorish style of the Alhambra, some of which had to be destroyed to make way for it, the palace has an artistic value of its own, being the first Renaissance building made outside of Italy. However, due to financial problems, the construction was a stop-and-go affair which continued over several hundred years, not being completed until the twentieth century, when it was made use of for the first time as a concert hall. Damage also occurred to the Alhambra in 1812, when the French blew up some towers, and later in 1821 from an earthquake. In 1828, restoration of the Alhambra began and continued into the twentieth century. The art within the Alhambra embodied the remaining portion of Moorish dominion in Spain and ushered in the last great period of the Andalusian art of Granada. Trapped without influence from the Islamic mainland, the Alhambra created a unique style characterized by its exquisite refinement and beauty, was perfected over the course of the Nasrid Dynasty. Elegant columns seem to soar effortlessly towards the sky and intricate muquarnas, a stalactite-like ceiling decoration, creating an airy appearance in several chambers. Interiors are often decorated with elegant arabesques and graceful depictions of calligraphy. 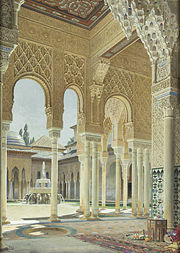 The splendid arabesques of the Alhambra interior are ascribed, among other kings, to Yusef I, Mohammed V, Ismail I, etc. After the Christian reconquest, walls were filled in with whitewash, painting and gilding was effaced, and furniture was damaged or removed. Philip V (1700–1746) further Italianized the rooms and completed his palace right in the middle of what had been a Moorish building. He ran up partitions which blocked up whole apartments. In subsequent centuries under Spanish authorities, Moorish art was further defaced; and in 1812 some of the towers were blown up by the French under Count Sebastiani, while the whole buildings narrowly escaped the same fate. Napoleon planned to demolish the whole complex. Just before his plan was carried out, however, a soldier reportedly defused the explosives and thus saved the Alhambra for posterity. In 1821 an earthquake caused further damage. The work of restoration undertaken in 1828 by the architect José Contreras was endowed in 1830 by Ferdinand VII; and after the death of Contreras in 1847, it was continued with fair success by his son Rafael (d. 1890), and his grandson. Washington Irving's Tales of the Alhambra (1831) is a collection of essays, verbal sketches, and stories written while Irving lived in the palace. It was instrumental in reintroducing the site to Western audiences. Salman Rushdie's The Moor's Last Sigh (1995) is also set in part in the Alhambra. Tessellations like this inspired Escher's work. Pieces by composers Ruperto Chapí, Tomás Bretón, and many others are also found ambiance in the Alhambra and its surroundings. M. C. Escher's visit in 1922 inspired his following work on regular divisions of the plane after studying the Moorish use of symmetry in the Alhambra tiles. Many other artists have used the Alhambra as a study for their paintings. From nineteenth-century Romanticism until today's architecture, a host of uneven, artistic-quality buildings, or portions of buildings, worldwide, have been inspired directly by the Alhambra. All links retrieved March 5, 2016. (Spanish) (French) (English) Grand tour of Alhambra. www.alhambradegranada.org. 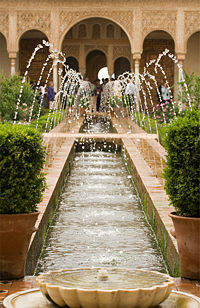 Alhambra - information on garden history and design. www.gardenvisit.com. This page was last modified on 5 March 2019, at 23:08.